Scotland head coach Craig Levein reflected on what he considered a worthwhile exercise following the 2-0 defeat to Brazil at the Emirates. The friendly came after a five-day squad get-together in Spain as Levein prepares the resumption of competitive matches later in the year. "I'm really pleased with the players," said Levein. "As a team I don't think we could've worked any harder. "This has been a great week for us. They're a great group, really tight." Teenager Neymar scored both of Brazil's goals in London, the second from the penalty spot after a foul by Charlie Adam, and Levein had few complaints about his team's performance, saying of Brazil: "They're a great side, aren't they? "We won't play any harder friendlies than that, it's impossible, and we've come away from the game having learned that to play at this level, we have to improve. "We have players who could play a lot better than they did today but I've no complaints whatsoever about the application. "We defended too near our penalty box for two thirds of the first half. But, in the second half, I thought we were better. We passed the ball a little bit better, we switched the play better. "The good thing for me is we've got a bunch of players that are disappointed that they didn't get anything from this game. "Charlie Adam is really, really disappointed with the way he played and it just shows you where he's come from. That's the level of expectation that he's got for himself. That tells you so much about the guy and how much that he wants to improve and learn. "Obviously, we'd have loved to get a goal or a get a draw out of the game. But we didn't and a lot of that has to go down to the quality of the opposition that we played against." Levein was also buoyed by the strengthening of relationships amongst the squad, helped in no small part by the retreat in La Manga. "We've managed to spend a bit of time together and you could see how much they wanted to try for each other," Levein added on BBC Radio Scotland. "This whole week was about bonding, getting together, understanding each other, getting to know each other. You saw that on the pitch, you saw that part of it. "What you didn't see was some of our players playing to the best of their ability but that, for me, is something that's easy to get because I know these guys will improve and get better. "I brought some younger players with us to savour the whole week, not just the game, and these are guys who I think will be international players in the future." Scotland resume their Euro 2012 qualifying campaign with back-to-back home matches against the Czech Republic and Lithuania in September. 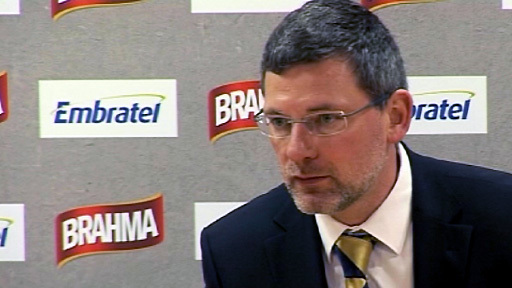 "These are the games that are the important ones and we'll be ready for those," added Levein. "We'll get Steven Naismith, Darren Fletcher, Jamie Mackie, Graham Dorrans and others back into the team. That's a quality group of players. "I'm not so sure Lithuania or Czech Republic would've done any better against this team [Brazil]. The Czech Republic had one shot at goal against Spain the other night, Spain dominated the possession."